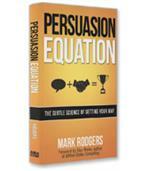 In 1984, a book by unknown psychologist Robert Cialdini purported to show the world the best way to influence people. Influence would become an international best-seller and help introduce the concept of social psychological analysis to a skeptical world. In Pre-Suasion, his first solo work since 1984, Cialdini adds a new take to the art of influence. “Pre-Suasion,” as he calls it, is the ability to do or say that one thing at just the right time before attempting to influence someone. For example, Cialdini tells the story of Jim, a fire-alarm system salesman who consistently sold significantly more of his company’s expensive systems than any other salesman. When Cialdini accompanied Jim, he saw only one thing that Jim did differently from the rest: While the prospects were filling out a fire-alarm test, he would invariably say that he had forgotten something in the car and ask if he could go get it. Because the prospects were in the middle of the test, this involved letting himself back in the house, sometimes with the help of a borrowed key. How was this planned forgetfulness helping Jim sell his alarm systems? The reason, according to Cialdini, is that letting someone enter the house on his own, with or without a key, is a sign of trust; subconsciously, Jim’s little (slightly unethical) charade made him much more trustworthy to the prospects, who were thus more inclined to believe his argument that they should have the system. Jim had instinctively discovered the power of pre-suasion. As Cialdini explains, there is a moment in time just before the attempt to influence (e.g., a sales pitch or a speech) called a “privileged moment”; during this window of opportunity, influencers should get the people they are trying to focus on something that will help the influencer’s cause. Here’s a simple (and actual) example from a research test. The researchers stopped people in a mall and asked them to fill out a survey. Only 29 percent agreed to participate. The researchers then started stopping people and asking, “Do you consider yourself helpful?” Invariably, most of those people (77.3 percent) responded yes and filled out the survey. The response rate went from under 30 percent to more than 77 percent ... just because of one simple question. 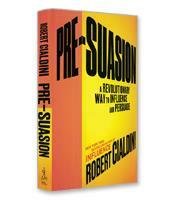 As with Cialdini’s first book, Pre-Suasion is filled with the science and research that explain the social psychological foundations of pre-suasion. The key component is the power of channeling someone’s attention. 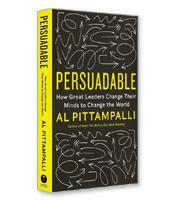 Whatever you draw attention to, Cialdini shows, that item becomes very important in the person’s mind. 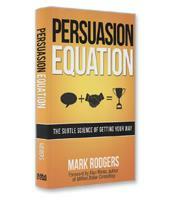 Pre-Suasion is filled with astounding stories such as these, which support a groundbreaking text on influence and persuasion that deserves to become as iconic as Cialdini’s first book.